Terms used in the conventional purchasing system and as referred in Oracle Purchasing may be different. 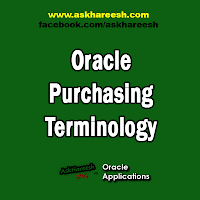 A brief explanation of the ‘Oracle Purchasing’ terms vis-à-vis the existing terminology is provided the following paragraphs. These terms are extensively used in documenting the ‘Purchasing - To Be’ flows and it is recommended that the various users of this system get acquainted with the same. Any Employee who requires specific items to meet his operational needs. Requestor may or may not have the system access to enter the on-line requisitions. Requestor with no computer access will give their requisitions manually on pre-printed requisition form to the requisition ‘Preparer’ within the concerned department. Employee in a department with the responsibility of entering Purchase Requisitions in the system. Employee with the responsibility and authority of approving the requisition and / or the Quotation Analysis Document and / or the Purchase Orders. Employee in the Purchase Department with the responsibility of entering the Requests for Quotation, the Quotations received from the Supplier and the Purchase Orders in the new system. Synonym for ‘Inquiry’. RFQs are sent to the vendors, requesting them for their quotations for the items / services required to be purchased. Quotations are the ‘Vendor Offers’ for the required items / services. It is a ‘Comparative Statement of Quotations’. Standard Purchase Orders are created for purchase of various items / services where details such as the quantity to be purchased and the negotiated costs. Blanket purchase agreements are signed with the vendor for the supply of goods / services over a period. Such agreements can be used when details of the goods / services you plan to buy from a specific supplier in a period are known, but you do not yet know the details of your delivery schedules. They can also be used to specify negotiated prices for your items before actually buying them. You can issue a Blanket Release against a Blanket Purchase Agreement to place the actual order with the vendor. The Releases should be within the Blanket Agreement effectivity dates. It is a long term agreement committing to buy items / services from a single source. The tentative delivery schedule is given to the vendor along with other details like quantities and estimated costs. This document is issued to the vendor against a Planned Purchase Order to place the actual order. This document will confirm the specific quantity and delivery date to the vendor. Contract Purchase Agreements may be entered into with suppliers to agree on specific terms and conditions without indicating the goods or services that will actually be purchased. Standard Purchase Orders can be issued at a later date referencing such Contracts. The purchasing person sends the requirement to various suppliers giving details of the item and can also specify own terms and conditions such as payment terms, price etc. The Supplier responds to the RFQ and sends their quotations mentioning details of the item and all their terms and conditions regarding payment terms, discount, delivery schedules, etc. The quotations received from various suppliers are compared and PO made for them in which all the terms and conditions of the firm are mentioned as regards to Payment, price, etc. After clearance from the receiving department about the receipt of goods, payments are made to the suppliers. After the items are received, payments made you can close the PO.